Fibres with a Twist is a new exhibition of silk painting, crochet, felting and weaving by the Cleveland Fibre Arts textile group. Running alongside this exhibition will be One Moor Year, featuring paintings by Robin Puplett that capture the drama of the seasons and landscapes of the North York Moors over a calendar year. Both exhibitions have opened at the Inspired by… gallery, Danby and run until August 24. Entry is free. Cleveland Fibre Arts was established in the early 1990s. The group of about 30 members – all women who live in the North York Moors and East Cleveland area – meets monthly to share knowledge and skills and to keep alive a number of traditional rural crafts. They specialise in working with textiles, in a variety of mediums, especially with wool – from processing fleeces and hand-dyeing to spinning, weaving, knitting and felting. All their work is inspired by the natural elements, moods and colours of the moors, coast and Cleveland Hills. Robin Puplett lives in Thirsk and is classically trained in both fine art and graphic design. His preferred medium is acrylic on canvas although he also enjoys working with oils or pencil. 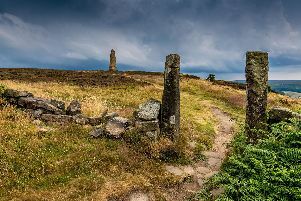 Robin draws his inspiration from the scenes, landscapes and skies of the North York Moors, and can often be found up on the hills or out in the villages sketching and photographing, always looking for the little details or big skies that make the National Park such a wonderful place to live and visit. Robin enjoyed a sell-out exhibition at the Spectrum Gallery in Thirsk, in May and was on the shortlist for the Sky Arts Portrait Artist of the Year award. His latest work reflects the dramatic visual changes in the North York Moors from month to month, season to season, based on visits over a full calendar year. He said: “My artwork is driven by places and people. Each and every painting is taken from a place I’ve experienced and been inspired by, a place I’ve travelled to or lived at, a place I’ve cycled by or walked through.